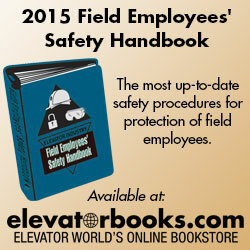 Questions for this safety quiz were taken from Elevator World’s educational safety products, which can be found here. After you complete all ten multiple-choice questions just click “Show me the answers!” If you missed any questions you will then be shown the correct answers. A new set of questions will be posted every other month. Enjoy and be safe out there! Can be traded with other employees freely. Leave your lock on for more than one hour at a time. Open the switch cover for the main-line disconnect. Question 1: The correct answer is All of the above . Question 2: The correct answer is Should be with employees at all times. Question 3: The correct answer is Motor vehicle incidents. Question 4: The correct answer is Install proper barricades/barriers. Question 5: The correct answer is Open the switch cover for the main-line disconnect.. Question 6: The correct answer is Temporarily defeat safety circuits . Question 7: The correct answer is Moving equipment and inadequate refuge area . Question 8: The correct answer is Hold crosshead or other structural car parts when car is moving . Question 9: The correct answer is Never strike hardened steel surfaces with a steel hammer . Question 10: The correct answer is Wear suitable work gloves . © 2015 Elevator World, Inc.